That’s is. I am banning posters and PowerPoints from my classroom. And I am banning them not simply because they are just not used outside the classroom (when was the last time you cut and pasted letters onto posterboard for your job?). I am banning them because there is no audience for them once students create them. At least, no authentic audience. When students create posters and PowerPoints, they are typically only viewed by the teacher and the 20-30 students in the same class. But if we want our students to be collaborative and creative content creators, we need to encourage them to create content that can be widely shared with actual audiences. Troy Hicks points out in Crafting Digital Writing that encouraging our students to think critically about the design choices they make while creating in digital spaces also translates to the rhetorical choices they make while writing. “With digital writing,” Hicks writes, “we need to think with words, of course; yet we also need to begin thinking like artists, web designers, recording engineers, photographers, and filmmakers. In other words, intentional choices about craft can lead to creative work in a variety of media” (18-19). And there’s a whole bunch of 2.0 tools that can help our students create dynamic, engaging presentations for audiences outside our classroom. To encourage more digital content creation in my classes next fall, I’m going to use one of my bulletin boards to a share a variety of digital presentation tools using QR Codes. I don’t plan on teaching each of these tools, but instead direct students to find the presentation tool that will be most effective for the task and tone they are trying to accomplish. Because each of these tools is created and shared online, many with the ability to embed and export into other locations, real audiences outside of our classroom will also have the ability to connect and view my students’ work. Below you’ll find not only the list of tools and their basic descriptions, but also a document you can print so that you can post and share these tools with your students as well (scroll to the bottom of the list). I selected these apps in part because they are available to use on multiple platforms, including use on Chromebooks which is what my school is moving toward. If you know of any that I should add, please let me know! PowToons 4Edu is a simple-to-use, animated presentation tool that incorporates comic book style illustration and sound to create engaging videos. PowToons is also releasing #Slides in beta form which is a version of dynamic slides that pull in thousands of royalty-free images for you and your students to use as you create engaging presentations to share online. Haiku Deck also pulls in thousands of royalty-free images from Flickr Creative Commons image search and automatically cites the selected images. The slide designs in Haiku Deck limit the amount of text students can include, making for more visually engaging presentations. Haiku Decks can be shared with a link, embedded, downloaded as a PDF, or even exported. TouchCast is all sorts of interactive. Create short videos and then overlay the video with interactive widgest called vApps which are allow viewers of your video to interact with live web pages and social media sites. You can include a live poll in your video which viewers can click on or your can pull up a live Twitter feed. Smore Flyers are versatile. Once you pick a theme, you can use Smore to create infographics, newsletters, simple websites, and online posters. Embed videos or pictures, maps or apps to further engage your audience. They share your Smore through social media or embed it on your own site. Smore is an incredibly easy-to-use, easy-to-share tool. Snapguide is a new tool for me, but one that I can already tell will become a staple in my teaching toolbox. Why? Not only is it easy to use, but its clean layout and simple design make Snapguide a great curation tool for both teachers and students. Have students use this app to create “guidebooks” for their unit materials, a studyguide for a unit, or track the historical influences on a character found in a Dickens’ novel. Canva gives users a bit more design control to its users over other infographic apps like easel.ly or infgr.am. And Canva’s library of royalty free images helps students create beautiful images, posters, website banners, infographics and more. But beware, you could easily get sucked into all the cool desgin templates and possibilitites that Canva has to offer. 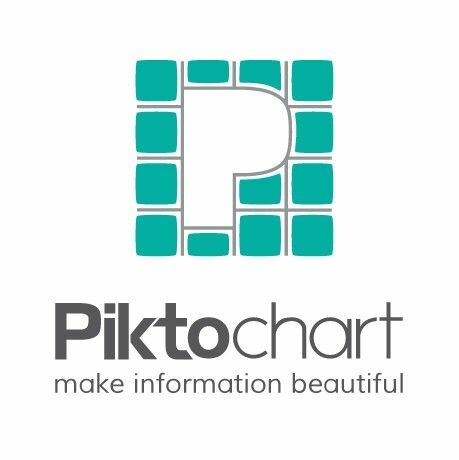 Piktochart is another great tools for creating infographics. The pre-loaded themes available through Piktochart make it easy for students to share their research and writing in clean, easy-to-follow digital spaces. This is a great tool for helping visual learners think through how organization of ideas impacts their audience/reader. Prezi for Education is used a great deal by students and teachers already, but I would be remiss if I didn’t include it on this list. Students can collaboratively edit and share their Prezis making this a great tool for students working both inside and outside of class to craft group presentations. It may take a bit of time for students to become familiar with how to use the design wheel, but once they do, the options for creating dynamic presentations are nearly limitless. 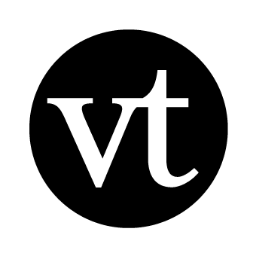 VoiceThread another already widely used tool by teachers. The ability to upload lesson materials and then have students login to respond using text, their voice, or their webcam makes VoiceThread a fantasitic tools for the flipped or blended classroom. But it can also be an engaging tool for students to use in the creation of their own presentations. If we want students to create presentations that connect with actual audiences, VoiceThread is a great tools for doing just that. And because you can embed VoiceThread into other sites, students could easily share their creations through multiple venues. 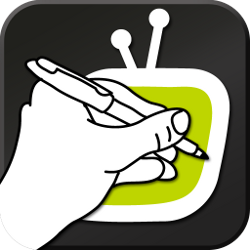 VideoScribe is also a tool for video creation and is a lot like PowToons in that students can use this app to create dynamic, animated videos. However, it is visually quite different. Rather than animated drawings, VideoScribe animates the actual drawing. So if you were looking to have you students create aCommon Craft or RSA Animate type of whiteboard video, this would be the app to use. CLICK HERE for an explanation and QR Code for each of the apps mentioned above. Print it out and share with your students or post to a classroom bulletin board. This is cross-posted at I Am A Teacher Et Cetera.